Well, it has certainly been a long while since I have posted here. The main issue has been that I have been traveling full time and traveling full time doesn’t lend itself to extreme couponing. Not having a base to collect the weekly inserts makes it virtually impossible to collect them in decent amounts to make purchases for the food banks worthwhile. Making matters even more complicated, traveling from city to city (many of which I am not familiar) makes it extremely difficult to know what grocery stores are available and what the deals are at these stores (since I also don’t have the weekly flyers for the stores in that particular area). The end result is that it makes it nearly impossible to coupon as I did when I had a set base. I have therefore decided to continue on with this project without clipping coupons. That means that instead of getting discounts of 80% – 100%, I will only be able to get discounts in the 60% – 80% range most of the time. These are still good discounts over the regular retail price, but still not the deals I was getting in the past. That being said, I will try to let readers know if they can get an even better deal with coupons even if I am not using them, and it should also show that it’s possible to get pretty decent discounts when grocery shopping even without clipping coupons. This week at Safeway (through Tuesday) Nature Valley granola bars are on sale for $1.49 each when you buy at least four. 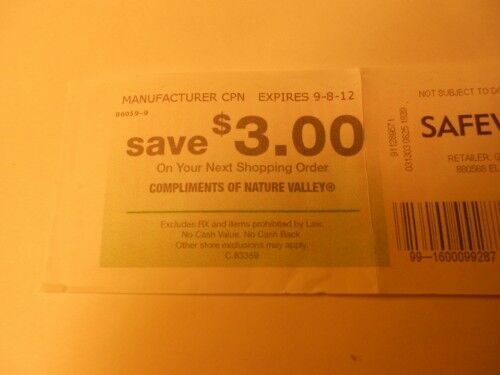 There is also a catalina coupon for $3.00 off your next purchase with the purchase of 5 boxes of Nature Valley granola bars (since this coupon is given to you at the cash register, I do not consider it clipping coupons). This means when you buy 5 boxes of Nature Valley granola (cost $7.45), you get a $3.00 coupon from the cash register for you next purchase making the price $4.45 for five boxes (you will need to pay $7.45 for the first purchase of 5 boxes, but if you decide to buy more, you can use the $3.00 catalina coupon in addition so all purchase after will be $4.45 — and you’ll get another $3.00 off coupon again so you will still have that at the end when you finished the granola purchases). 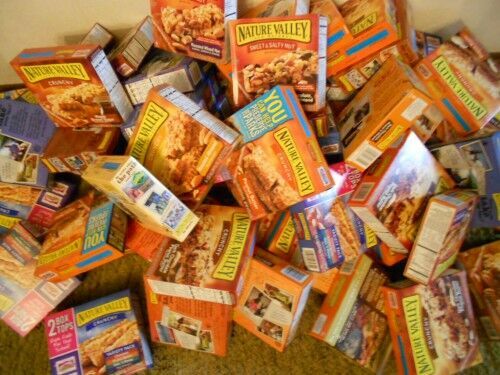 I was able to purchase 65 boxes of Nature Valley granola with a retail value of $259.35 for $57.85. This was a 78% discount over the normal retail price or $0.89 a box without clipping any coupons. I have to admit that I have an affinity for Nature Valley because they also support our National Parks where I do most of my traveling these days, so it was an added bonus to this purchase. The final feather in the cap was that these all come with Box Tops for Education (some with double) that I will take off before donating to the food bank and will give to local schools so they can get needed supplies for free. For those of you out there that have been saving coupons, there are some out there that you can use to bring the price down to $3.10 for 5 boxes ($0.62 per box). This entry was posted in Penny Experiment and tagged catalina coupons, extreme couponing, granola bars, Nature Valley, no clipping coupons, Safeway. Bookmark the permalink. I think you’re doing a great job without being a coupon clipper – you go girl! You know, helping out the schools is great! I used to do that, but now I trade box tops for coupons. I get coupons I need, and the people I trade with help their kiddos win prizes by taking them to school. It’s a “win/win” situation in my book!